Sunscreen helps protect skin from the sun's harmful rays that can cause sunburns or even skin cancer. The fact that it blocks the rays to a degree (the degree depends on the sunscreen’s SPF factor) does not mean you can’t tan while wearing sunscreen. Some sunscreens only filter one type of UV light, UVB, and allow the UVA rays to get through, which allows the skin to tan. For anyone concerned with skin cancer, however, it is important to note that even though a tan is not painful like a burn, a tan still indicates skin damage. Use a sunscreen that is lower than SPF 15. 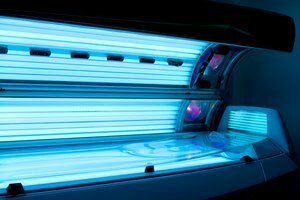 If you tan or burn easily, a higher SPF will also work, but you’ll likely need to be out in the sun longer. You should also check to see that the sunscreen blocks only the UVB rays and not the UVA rays that allow tanning. Spread the sunscreen over all exposed areas of your body. This includes your face, ears and your feet if you are going barefoot or wearing sandals. According to the American Osteopathic College of Dermatology, you should apply sunscreen only to cool, dry skin and do so at least half an hour before you go out into the sun. Lay on a chaise lounge either on your back or on your stomach. Remember to put on sunglasses to protect your eyes if lying on your back. Remain on one side for 15 minutes before turning over. Go indoors after half an hour (15 minutes on each side) to check your progress. You may not see color immediately. Whether you have any results after this amount of time will depend on your skin type and how strong the sun is that day. However, to prevent a burn, go out for only an additional 15 minutes per side on that first day. Repeat this procedure daily until you have a tan. You may increase the amount of time you are in the sun if your skin is showing no signs of tanning after the first day. To maintain the tan after this, lay out in the sun once or twice a week for a half hour. According to the American Osteopathic College of Dermatology, you should re-apply sunscreen if you perspire heavily or have been swimming. When Is the Best Time to Tan Outside?